Stan Wawrinka and Tomas Berdych played a very entertaining, Masters 1000 semifinal at the #CajaTrágica (copyright: Steph Trudel) yesterday. Through most of two sets, it was the recent Portugal Open champion who looked like the likely winner, only to surrender control of the match so dramatically that Tomas Berdych found himself up a break at 4-2 in the deciding third set. Wawrinka, however, found some extra energy somewhere within him (the Swiss was playing his 9th match in 10 days, and had been the unfortunate victim of the terrible scheduling of the past two days at the #CajaTrágica) and won the last four games of the match to clinch an appearance in just his second Masters 1000 final of his career. I thought the match was well played – particularly for most of the first two sets. 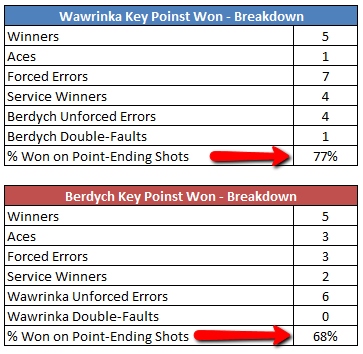 I was fascinated by the fact that until the 4-all game in the second set, only 2 out of 20 Key Points (Game Points, Break Points, Set Points and Match Points) had been decided by unforced errors. 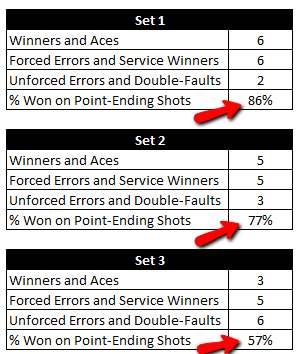 That simply meant that 91% of Key Points had been decided by Point-Ending Shots (Winners, Aces, Forced Errors and Service Winners, or as Josh puts it, anything other than unforced errors). The above stat is simply remarkable. In all the Key Points Analysis posts that I’ve written, I’ve never seen such a crazy number. It tells you all you need to know about the high level at which Berdych and Wawrinka were executing difficult shots, and they also tell you just how aggressively they were both playing. That 4-all game in the second set was also significant, because it was the first time that the server (in this case, Stan Wawrinka) failed to convert a Game Point. Until that ninth game of the second set, 15 straight Game Points had been converted. And the odd thing is, those two Game Points Wawrinka lost in that game were the only two Game Points lost by either man during the contest. You might think that this is not that extraordinary: most people end up holding serve most of the time. However, I just went through all my Key Points Analysis data (which now includes 5 matches), and this type of efficiency is very rare to find in both players during a match. Only winners – Maria Sharapova (in both the semifinal and the final in Stuttgart) and Novak Djokovic (in the Monte Carlo final) displayed that type of efficiency with their Game Points. Yet yesterday we saw Tomas Berdych bow out of the Madrid Masters even though he converted all of the Game Point on his serve. Of course, Berdych’s serve was indeed broken four times. You can infer from this bit of information and the paragraph above that perhaps the Czech was oscillating too dramatically between excellence and mediocrity in his service games, and he never could muster some of those great deliveries in the four service games in which he found himself in trouble. Surviving bad service games is an art form in professional tennis, since the opposition is often talented enough to make you pay whenever they see an opening. Regardless, let’s go back to that ninth game of the second set, because another trend was broken. 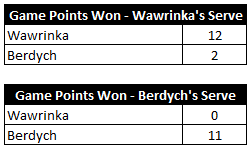 Four Key Points were played in that game: two Game Points for Wawrinka and two Break Points for Berdych. Three of them were donated via unforced errors (two errant forehands from Stan, one bad backhand from Tomas), which means that there were more unforced errors in Key Points in that lone game than in the 17 games before it. Simply put, as the semifinal wore on, more and more Key Points were decided by unforced errors. Which is perfectly understandable, given the occasion. Notice how Stan Wawrinka won a little over three quarters of his Key Points via Point-Ending Shots, which is a very, very high number. You can also see that both Berdych and Wawrinka fired the same amount of winners, but Stan had the clear edge in forced errors. Surprisingly, the Swiss also had the edge in service winners, though if you add aces and service winners, both guys ended with the same number (5). – Stan ended up winning just three more Key Points than Tomas (22 to 19). – Berdych couldn’t muster a single Key Point on Stan’s serve in the first set. Stan was just as powerless against Berdych’s serve in the second set. – The number of forced errors equaled the number of (groundstroke) winners for the match – and that’s just on Key Points! Again, this just tells you how aggression is measured so inadequately by the “winner” stat on its own. – Also, nearly 1 out of every 4 Key Points were won with very good serves (4 Aces and 6 Service Winners) – and this is a clay event. Yes, neither man is a stellar returner, and both have very strong deliveries. Still, this just tells you what a nice advantage it is to have a good serve. – There were 16 break points played during the match. They were evenly distributed in more than one way: not only did each man face 8 break points (Stan saved 6, Tomas saved 4), but out of those eight, both Stan and Tomas donated four via unforced errors. And out of those four, two unforced errors by the server on Break Points handed over the break. Love that symmetry. – Stan Wawrinka finished the match on a 4 game winning streak, which included taking 6 out of the last 8 Key Points. Half of those came via Berdych unforced errors, which cannot possibly please the World Number 6. – All 5 of Berdych’s winners on Key Points were forehands. Three of them were of the inside-out variety, one was down the line, and the remaining one was a volley. – Wawrinka favored his thunderous backhand for winners on Key Points: 3 came from that wing. And in a sign of just how good Stan’s backhand is, two of those winners on Key Points came through inside-out backhands, which is a fairly difficult (and uncommon) shot. – Stan forced Berdych’s error 7 times on Key Points, as we saw above. Four of those came when he attacked Berdych’s backhand corner, with either his own cross-court backhand, his down the line forehand or his inside-out forehand. It’s never a bad idea to try to make Berdych defend on that wing. – Stan committed 4 of his 6 unforced errors on Key Points with his forehand. Interestingly enough, all of them came when he was hitting that shot from the AD court (his backhand side). – Strangely enough, all four Berdych unforced errors on Key Points (two forehands and two backhands) came when the Czech was trying to go down the line. By winning this match, Stan Wawrinka continued his remarkable 9 match winning streak, which includes 3 victories against top-10 opposition (Ferrer in Portugal, Tsonga and Berdych in Madrid). Stan will also be back in the top 10 on Monday, and will be ahead of Roger Federer in the ATP Race. Suffice to say, things are going well for Stan The Man. However, what seemed most remarkable about Stan’s win was how he found a way back into a match that he seemingly had under control, but was on the verge of losing. Most people would agree that Wawrinka seemed like the likely winner at 4-all in the 2nd set. But that was where he seemed to fade away, which in turn made Berdych seem like the inevitable victor when the Czech was up 4-2 in the third set. And yet, Stan found a way back in, by doing all the good things he had done for the better part of sets 1 and 2: being responsibly aggressive, serving well, and executing a sound gameplan. As for Tomas Berdych, he will surely be distraught at how he finished this match. Two games away from defending his finalist points from last year, he collapsed in a heap of unforced errors. His serve abandoned him, and so did his forehand. Which is quite unfortunate, given that he, too, had found a way back into a match that seemed to be getting out of reach. Let’s hope Stan has enough fuel in the tank as he is set to face the toughest challenge in men’s tennis: Rafael Nadal on a clay court. The Swiss has never taken a set off Nadal, so he must surely feel like a heavy underdog. And underdogs with tons of firepower and a feeling of playing the final with house money are supremely dangerous. Particularly when they’re on a 9 match winning streak. Very interesting analysis. I watched the match live and thought that both guys were actually quite nervy in the first set — players like them don’t get very many chances to make a M1000 final in the Big Four era, after all — and that the overall quality was actually better in the second set. We both agree on Berdych completely losing the plot in the end, though.